Jacque Vaughn (born February 11, 1975) is an American former professional basketball player and coach who is currently an assistant coach for the Brooklyn Nets of the National Basketball Association (NBA). A native of Altadena, California, Vaughn attended John Muir High School in nearby Pasadena, where he maintained a 3.94 GPA in honors and AP courses, and became the best high school player in that area since former Muir and NBA standout Stacey Augmon. Vaughn excelled both on and off the court, and by his senior year was ranked as high as the #7 high school recruit in the country and the #2 point guard in the class of 1993 behind arguably the nation's top player that year, Randy Livingston. Over the course of the season, Vaughn averaged over 21 points and 19 assists per game, while also compiling six triple-doubles. Named a First-Team All-American by nearly every publication on the market, Vaughn rounded off his special season with a selection to participate in the prestigious McDonald's All-American Game where he put on a show, scoring only 6 points but amassing 13 assists (still a McDonald's record), while also thoroughly outplaying the higher-ranked Livingston once again—this time on a national stage (they had both matched up against each other in the All-Star Game of the 1992 Nike Camp), and was named co-MVP with North Carolina's Jerry Stackhouse in the process. 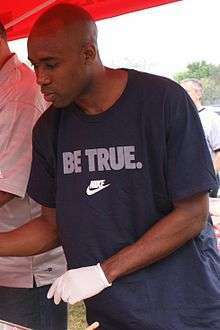 After considering Georgetown, Indiana, UNLV, Arizona and UCLA, Vaughn decided to play for coach Roy Williams at Kansas, continuing, along with fellow recruit and college roommate Scot Pollard, the California pipeline of high school hoopsters to Lawrence, Kansas, started by former standouts Adonis Jordan and Rex Walters, and continuing in later years with Paul Pierce, and Eric Chenowith. As a senior in high school in 1993, Vaughn was awarded the Dial Award as the nation's top male high school scholar-athlete, becoming the first basketball player ever to win that award. In his college career Vaughn became the starting point guard as a freshman after being chosen to replace incumbent starter Calvin Rayford. Among Vaughn's first-year highlights were earning the MVP award at the 1993 Pre-Season NIT at Madison Square Garden in New York City and hitting a game-winning three pointer at the overtime buzzer to beat Indiana in an early season game at Allen Fieldhouse. Throughout his four years at Kansas, Vaughn was known as a good distributor of the basketball and effective defender with great speed and court awareness. By the end of his college career, he was the all-time leader in assists in Kansas basketball history with 804 total (since surpassed by Aaron Miles), as well as the Big Eight Conference's all-time record holder. In 1997, the award given annually to the school's assist leader was renamed to include Vaughn, Miles and original assists leader, Cedric Hunter, as the Hunter/Vaughn/Miles Assists Award. Vaughn earned a 3.72 GPA as a Business Administration major. He was a two-time Academic All-American at Kansas and the 1997 GTE Academic All-American of the Year. He was also a two-time all-conference pick and was named the Big Eight Player of the Year in 1996. His college jersey was retired on December 31, 2002 and hangs in the rafters of Allen Fieldhouse. In 1997, Vaughn was selected 27th overall by the Utah Jazz in the 1997 NBA draft. In addition to playing four seasons in Utah, Vaughn also played with the Orlando Magic, the Atlanta Hawks (in two separate stints), New Jersey Nets, and San Antonio Spurs. He appeared in 64 games for the NBA champion San Antonio Spurs during the 06-07 season and finished his career there, retiring after the 08-09 season. Over his career, he averaged 4.5 points per game and 2.5 assists per game. He also set an NBA record for consecutive missed field goal attempts to open a season, missing his first 22 to start the 2001 season with the Atlanta Hawks. After those 22 straight misses he shot a career best 47% that season. Vaughn was an assistant coach with the San Antonio Spurs from 2010 to 2012. On July 28, 2012, Vaughn was named the new head coach of the Orlando Magic. On February 5, 2015, he was fired by the Magic. Vaughn and his wife Laura, who was his college girlfriend, have two sons, Jalen and Jeremiah. Vaughn enjoys reading and writing poetry. ↑ "Brooklyn Nets Finalize Coaching Staff". NBA.com. July 5, 2016. Retrieved July 10, 2016. ↑ "BHSN: Orlando Magic hire Jacque Vaughn as new head coach". Central Florida News. July 28, 2012. ↑ "Jacque Vaughn". KUSports.com. Archived from the original on December 21, 2005. ↑ "Jacque Vaughn named as Magic head coach". WFTV Channel 9 Orlando. Retrieved 28 July 2012. ↑ "Player Profile: Jacque Vaughn". NBA.com. Retrieved July 28, 2012. ↑ "Vaughn Has Learned All the Right Lessons". The New York Times. January 20, 1997. Retrieved July 28, 2012.